Ketut Madra and 100 Years of Balinese Wayang Painting, the recent exhibition at the Museum Puri Lukisan in Ubud ran from 7 October to 7 November 2013. 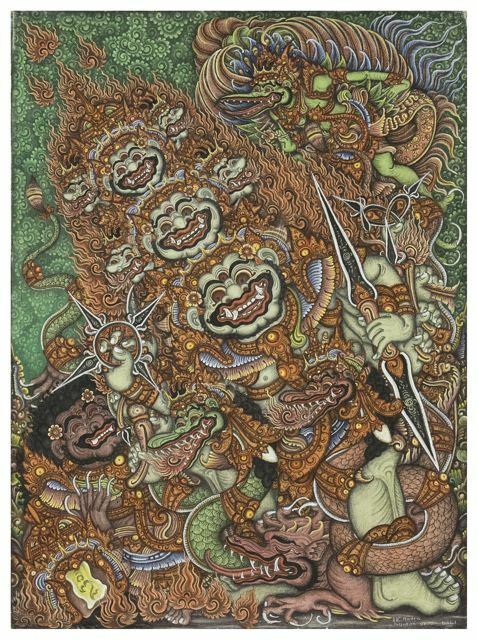 The show included 69 paintings by Ketut Madra and 23 other artists and presented a wide-ranging survey of Balinese wayang art of the past century. Many of the paintings in the exhibition were collected by guest curator David Irons when he spent a year living in Bali in 1973. These are supplemented by work from the Museum Puri Lukisan, ARMA, and private collections in the USA and Bali, including 15 works from Ketut Madra’s own collection. A 64-page, large format, color catalog, in English (with Indonesian translation) by Mr. Irons accompanied the exhibition. The catalog is available at the museum, by mail from this website, and later as an e-book. Wayang painting is an integral part of Bali’s Hindu-Buddhist faith. It began about a thousand years ago to tell great legends with moral lessons on the screens, curtains, walls and ceilings of the island’s temples, palaces, and homes of wealthy patrons. The art is alive today in the temples where it began and in modern interpretations. With works by two dozen artists, this exhibition offers an introduction to wayang painting over the past century. While focusing on the work of Ketut Madra of Peliatan, the most accomplished living master of the art in the Ubud area, it also includes pieces by 23 other painters dating from the early 1900s to the present. Almost all the paintings are by artists living near Ubud and in the village of Kamasan, south of Klungkung. This exhibition has three sections. 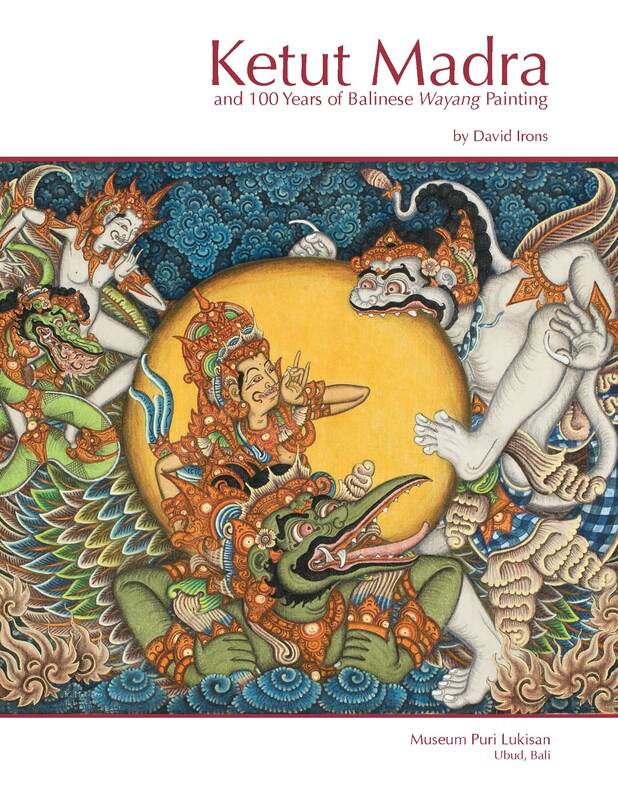 The first features aspects of Balinese cosmology ranging from contemplative scenes to very active ones. Deities, heroes, demons, and servants act with all the human emotions of love, compassion, wisdom, anger, fear, jealousy, and greed – as well as bawdy humor. The second focuses on the Ramayana. The first six paintings by six artists show familiar scenes from the epic: the abduction of Sita, wife of Rama by the demon king Rawana; the aerial battle with the bird Jatayu in his failed attempt to rescue her. Thirteen others depict Rama and the great monkey army led by the general Hanoman in their epic struggle to recover Sita from the demons who hold her captive. The third section tells stories from the Javanese-Balinese Panji or Malat semi-historical romances, and includes episodes from the other great Hindu epic, the Mahabharata. It also shows the young Hanoman and the sun god Surya; Sutasoma, an incarnation of Buddha; and the mortal combat of Kresna, an incarnation of Wisnu, with the demon Boma. Note the three pairs of paintings telling the same stories by Ketut Madra and Gusti Ketut Kobot (24 and 25, 55 and 56, and 65 and 67). Born in Pengosekan a generation apart, they advanced modern interpretations of wayang painting. Of special interest is Ketut Madra’s homage to the famous work by Ida Bagus Gelgel in the collection of the Museum Puri Lukisan (68 and 69). We hope this exhibition opens the door to a world of Balinese storytelling as a point of entry to the island’s religion and culture.